The Secretary of State toured the site, visiting the jam-making factory and seeing fruit picking on the farms before holding discussions with Joint Managing Director Chris Newenham, representatives from the National Farmers Union in Essex and local farmers about the future of farming, seasonal workers and food exports. “It was a pleasure to visit Tiptree Farm today for a valuable discussion with local farmers and businesses about how we can make agriculture as successful and innovative as possible. “The two year seasonal pilot announced this week will help farms like this one and ease the workforce pressures that are felt during the busiest months of the year. 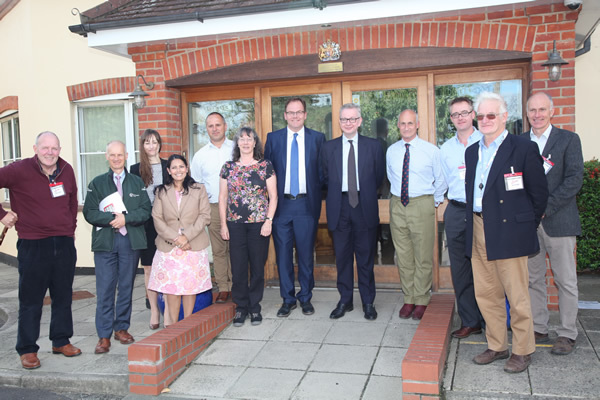 “We were delighted to welcome the Environment Secretary to our farm at Tiptree. Following a brief tour of our fruit production we had a broad discussion with a group of local farmers covering: cheap food, producer organisations, flood defences, irrigation licencing and more crucially, given yesterday’s announcement by the Home Secretary, the details of the proposed pilot scheme for seasonal workers.